Childrens boot slippers knit with double yarn. 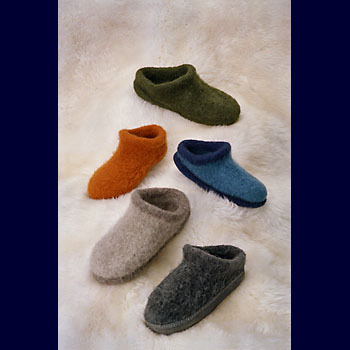 Designed to be felted to a very thick, firm fabric, these boot slippers will keep feet warm and cosy. They feature double soles for extra comfort and longer wear. Size: Childrens sizes x-small, small, medium, large and x-large. To fit foot lengths of 5 (6, 7, 8, 9) inches. Actual size is achieved during felting. 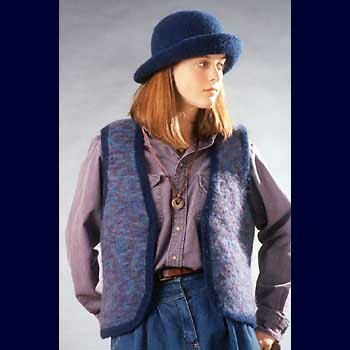 High top boot: Approximately 300 (320, 410, 470, 550) yards worsted weight easily felted yarn and 55 (60,70,80) yards of synthetic for cuff and trim. Low top boot: Approximately 290 (300, 380, 430, 500) yards worsted weight easily felted yarn and 55 (60,70,80) yards of synthetic for cuff and trim. Needles: US size 13 (9 mm) 16 inch (40 cm) circular. You will also need an extra smaller circular. Gauge: 10 sts = 4 inches (10 cm) before felting.